Easton BASEBALL TRAINING AIDS Easton baseball training aids features: Easton baseball training aids include the Hyperlaunch, 7’ Pop-Up Catch Net, 5” Pop-Up Multi-net, Playback Trainer, Pitcher’s Trainer, Pitcher’s Target, Lefebvre Supertee, Deluxe Batting Tee and Diamond Batting Tee. All this equipment helps in training the youngsters well in baseball. These items have been developed with the experience of Easton as sports equipment maker for almost a century. Easton baseball training aids meet the highest standards. The equipment is made with durable material to work hard and last long. The Easton Hyperlaunch is a multi-functional training tool which is useful for all ages. It is ideal for both in-field and out-field drills. It has a breakdown handle for compact storage and it shoots over 200 feet. 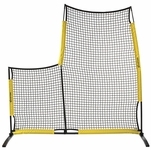 The 7’ Pop-Up Catch Net is great for practice and pre-game warm up. It comes with two breakdown poles with pole pocket and four ground stakes for fixing it. It is easy to arrange and take down. It uses durable steel flat wire with heavy duty durable netting. Easton baseball training aids are the best in the circuit. The Easton playback Trainer features adjustable upper bracket for increased training options and comes with heavy duty weatherized netting. It provides for speedy assembly and needs no tools. The best thing is that this item is perfect for all skill levels. This Easton baseball training aid is also useful for soccer and basketball. 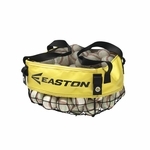 The Easton Pitcher’s Target is a multi-functional device. It is made of heavy duty, all-weather tarpaulin. The Lefebvre Supertee is designed by a professional player. It has top-quality solid rubber construction. Hitting tube easily adjusts to any height from 26” to 36”.The Deluxe Batting Tee has heavy duty and high quality base and is useful for individual practice or game-use. The Diamond Batting Tee is a great entry level tee. It has an adjustable plastic tee extension. It comes with an attached ball. All Easton baseball training aids are the result of innovation at Easton.